Loida Nicolas Lewis revealed her disappointment to Aung San Suu Kyi's refusal to meet both Senator Leila Dilemma and Kris Aquino. Lewis wasted no time to reveal her plan to restore democracy and install the new Daang Matuwid Plan. "If there is Plan A and it fails then there is Plan B, Plan C. That's what I have. I am so disappointed that Mar Roxas didn't become president. But there is still a Plan B and a Plan C. It's about time to move for the yellow age plan that will create a new Philippines. The loss of Mar made me think about this one that Kris Aquino has the better capacity to lead the nation. She doesn't need much experience in politics to create the yellow age that will bring progress to Filipinos. Right now, the government must work hard on a second EDSA that if and if impeachment doesn't work then there should be a new EDSA before Duterte will become another Marcos or before Bongbong Marcos becomes the vice president. No recount. Leni is the certified winner. I have no intention to overthrow Duterte but I am doing this to save the Philippines." said Lewis in an interview in New York. The plan for a New EDSA Revolution was revealed that if Leni Robredo is not the next Cory Aquino then it will be the latter's daughter Kris. "Like mother, like daughter. Kris herself has the genes of the late Cory Aquino. Filipinos must remember how Cory restored democracy and how the Aquinos fought for a better Philippines. She like her father Ninoy will fight for freedom. Knowing that she may be martyred anytime we will keep maximum security for her. Kris' popularity and high moral integrity are enough to lead the Philippines to a golden age. The fact she is willing to be the next Aung San Suu Kyi brings tears to my eyes. Kris herself may be the last hope to restore democracy. But I am so disappointed Aung San refuses to meet with her and Dilemma. Instead, she chooses to shake hands with a killer like Duterte. But we need not to worry. Kris will be the beacon of hope for EDSA-4. But we will not call EDSA, EDSA anymore. EDSA should be renamed into the Jim Parada avenue. If Aung San refuses to meet with Kris then I suggest the former's removal. Kris should be the new worldwide icon of female empowerment and battle for democracy." University of the Philippines student regent Raoul Manuel was last seen leading a rally called "Walk for democracy." Some UP students were seen carrying placards saying "Resign Duterte", "Kris For President For 2022", "Kris Is The New Icon Of Democracy." and "Yes to a Kris Aquino Presidency.". Manuel said, "Duterte is a killer. The president is a mad man. We don't need more proof that he did all the 7,000 killings. Think about why CHR Vice Chairman Filipo D. Hippo and his peers got arrested after Senator Leila Dilemma got arrested. It's because this administration wants to silence the truth. Just trust the word of the Aquino. The truth that the Aquinos and their associates hold is the only truth Filipinos need to know. The 1987 Constitution is the best constitution compared to the plans for a federal-parliamentary free trade Philippines." 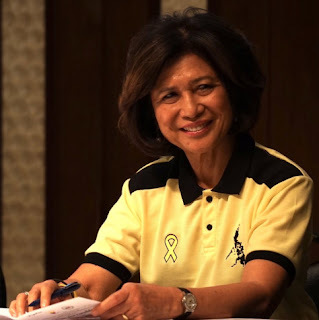 EDSA-4 is revealed that they will oust President Rodrigo Duterte, that Leni Robredo will be the transitional president, Kris Aquino will sit in the Senate from 2019-2022 and she will sit as president for 2022-2028. Whine Philippine Daily Non-Inquirer, Crappler and ABiaS-CBN said millions came to support the rally but it turned out to be that there were only hundreds.